This recipe was supplied to Elizabeth David from an Avignon restaurant, via a generous reader. It is a perfect study of the use of subtle aromatics and saffron with seafood. You may choose to make the béchamel sauce and cook the mussels in advance of cooking the mussels. Prepare the mussels. : Discard any broken shells or open shells that do not close when tapped. Plunge them in several changes of cold water, agitating the shells together in the water. Strip the beard from the shell. Cook the Spinach: Trim the coarse stems from the spinach and remove any wilted leaves. Choose a pan large enough to hold the mussels – use this to cook the spinach too. Place the pan over moderate heat. Add the spinach a handful of a time. Using a pair of tongs, toss it well. As the first handful begins to wilt and create room in the pan, add another handful. Repeat until all the spinach is in the pan, this should take no more than a minute or two. Cook until all of the spinach has collapsed – really only a minute or two. Toss with the tongs, remove from the heat. Drain into a colander reserving the water to cook the mussels in. Once the spinach is cool enough to handle, wring any water remaining, with your hands. Chop the dry spinach roughly and set aside 1 – 2 tablespoons for the dish. Make a thick Bechamel Sauce: This will only take a couple of minutes. Measure the milk into a small saucepan and place over moderate heat to warm through. Use a small / 1 litre capacity saucepan to make the sauce. Melt the butter and as soon as it starts foaming, add the flour. Stir over moderate heat to create a smooth paste, continue cooking for a minute or two to allow the flour to cook. Slowly add the milk to the butter and flour, stirring all of the time. Because you are stirring in hot milk, it will thicken very quickly. If it is lumpy, just continue stirring over low to moderate heat until it is smooth. Continue stirring for at least another 5 minutes. If it is more like a dough, you can thin it by adding a little more milk and beating it into the béchamel as you go – do this very carefully, you want a very thick sauce. Do not season, wait until the dish is complete as the mussels and the mussel water can be very salty. 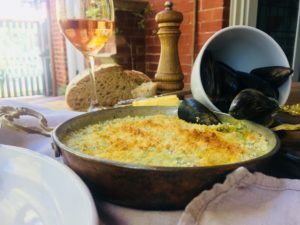 Cook the mussels: Place the water, the mussels, chopped onion, bay, parsley stalks, thyme and fennel seeds into the spinach pot over moderate to high heat. As each mussel opens, remove it from the pot and set aside. Shell each mussel, reserving some of the shells. Reserve all the liquid you can. Strain the juices remaining in the pot into a clean measuring jug. : Either do this using a fine wire strainer or better still, line a fine wire strainer, lined with a piece of damp muslin. Infuse the saffron: First measure 300 mls of the strained mussel and spinach juices. Remove 75 mis and set aside to infuse with the saffron. Allow to infuse while you get on with making the sauce using the remaining measured juices. You want to create a good ‘butter’ colour from the saffron. Make the sauce -: Use the pan the béchamel sauce is in. Add the remaining 225mls of strained mussel juices to the 150mls of very thick Béchamel Sauce into the mussel pan or bowl. Add the saffron infusion, stirring to achieve an even, butter yellow colour. Assemble the dish. : Have ready a heatproof dish. Spread with breadcrumbs and tiny pieces of butter. Reheat in a hot oven for about 10 minutes until the top surface is golden brown. Serve with a dry Provencal Rose and very good bread.